Last weekend I attended the Koh-Koh-Mah & Foster Living History Encampment near Kokomo, Indiana. This celebration reenacts the period of what we call the French & Indian War. Music is a big part of the weekend. A fife and drum corps played a moving rendition of the National Anthem at the opening ceremony. Groups played and sang songs from that time period. 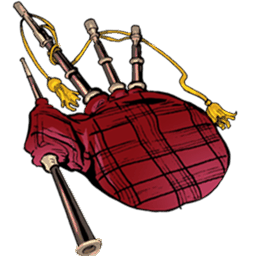 At the conclusion of the Sunday morning church service, a man played a beautiful version of Amazing Grace on the bagpipes. While music changes over time, our love for it never diminishes. Music continues to teach, comfort, challenge and inspire. It is no wonder the Bible contains many exhortations to sing and play music to worship the Lord. “Let the word of Christ dwell in you richly as you teach and admonish one another with all wisdom, and as you sing psalms, hymns and spiritual songs with gratitude in your hearts to God.”—Colossians 3:16. This entry was posted in Christian Living and tagged Bible, Colossians 3:16, French & Indian War, illustration, Koh-Koh-Mah, Kokomo, music, reenactment, worship. Bookmark the permalink.